Whether you drive a high-performance modern muscle car or a fuel-efficient commuter in Johnson County, your engine is a precision machine with hundreds of moving parts that work in unison. Everything relies on perfectly-timed fuel delivery, ignition and properly-metered air, otherwise your engine will run poorly, if at all. If your engine is running rough, your check engine light is on, you’ve got black exhaust, or your car won’t start, it’s probably time for some sort of engine repair. 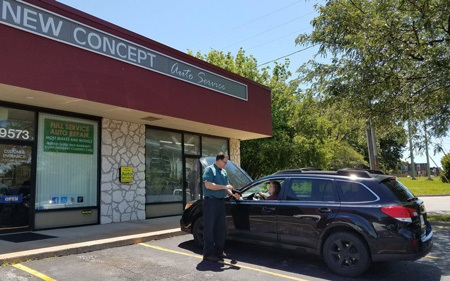 For 30 years, New Concept Auto Service has been the best choice for engine repairs in Overland Park and the surrounding communities. Our staff members are knowledgeable and friendly, offering the best in professional engine repairs while setting the bar high for customer service. At New Concept Auto Service, you’re assured of high-quality work from one of our ASE-certified master technicians. We undergo continuous training to ensure each repair we complete meets the most recent standards. Whether your Chevrolet Equinox requires new timing chains, your Chrysler HEMI needs new spark plugs, or your Honda Civic has MAP sensor problems, we can handle it. We take care of the most difficult diagnoses that other shops can’t figure out, from fuel system diagnostics and module programming to engine performance troubleshooting and repairs. We know you need your car to be dependable in all situations. For this reason we use only high-quality aftermarket and original equipment parts and fluids for engine repairs at New Concept Auto Service. Honest. Accurate. New Concept. Call us or use our online appointment form to schedule your engine repairs today! At New Concept Auto Service, you can rest assured that an ASE-certified technician is working on your engine repair. We have the expertise and training to repair any concern that pops up, from fluid leaks to worn out parts. We perform Engine Repairs on all domestic and import models, regardless of the vehicle’s age. We have the necessary diagnostic tools and the repair technology to efficiently and accurately perform your engine repair right the first time.